The Comp Cams Three-Piece Billet Aluminum Timing Covers for Small and Big Block Chevrolet engines allow access to camshaft timing adjustments without having to remove the harmonic damper of disturb the oil pan seal. Designed to be lightweight yet rigid, these billet covers offer convenience and performance in one easy-to-install package. 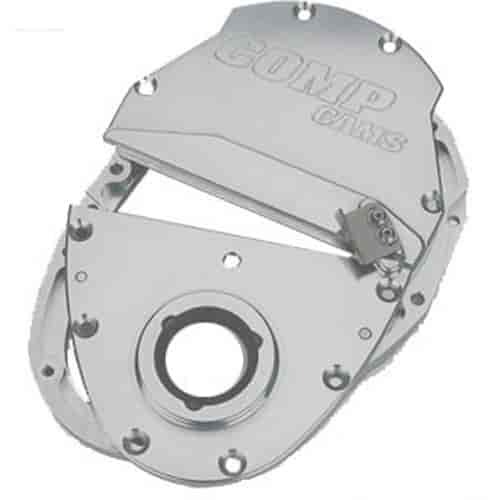 Comp Cams now offers timming chain covers for popular GM applications. The steel timing cover has a welded thrust plate tab for use with a cam button. Lightweight two piece timing covers eliminate timing cover flex, which causes erratic ignition timing. They allow camshaft replacement without disturbing the oil pan seal. Camshaft endplay adjustment is simplfied with the dial indicator access hole. Three piece timing chain covers offer the advantages listed above with one more key feature. Access to timing adjustments without having to remove the harmonic damper. Designed to be lightweight, yet rigid, these billet covers offer convenience and performance in one easy to install package. Each kit includes gaskets, seal, and hardware. Does COMP Cams 310 fit your vehicle? Does the Comp Cams 310 timing cover fit behind the so-called &quot;short water pump&quot; on a small block chevy 327? Yes, this is designed to be used with any water pump.